Despite MK Sharon Gal's attempt to shame right-wing MKs into voting for his death penalty bill, legislation loses badly by 94 to six. The Knesset plenum soundly rejected Wednesday a preliminary reading of the bill proposed by Yisrael Beytenu MK Sharon Gal which seeks to impose the death penalty on convicted terrorist murders. The explanatory notes to the bill state that the "fight against terrorism is the world's greatest challenge in the 21st century, even more so, Israel's greatest challenge. The purpose of this bill is to serve a major deterrent for perpetrators of terrorist acts." 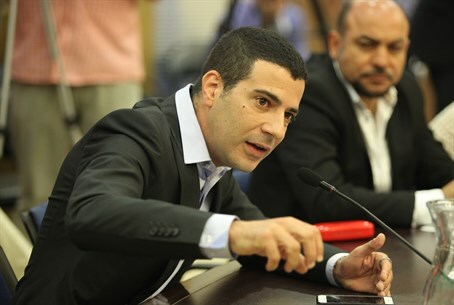 MK Gal spoke before the vote on his bill, which he brought directly to the Knesset after the Ministerial Committee for Legislation decided Sunday to postpone a vote on it - on orders from Prime Minister Binyamin Netanyahu. "There are moments in a political career which are critical," Gal insisted. "If you pass this law, we will save lives and, above all, serve justice and send a clear message to terror organizations that Jewish blood is not worthless." "I wonder if you will go with the 87% of the Israeli public who support the law, or will choose, because of petty politics, to turn away from them," Gal added. "I have no doubt that if everyone would vote according to his conscience and not other considerations," the MK said in veiled reference to Netanyahu's interference, "this bill would pass." Turning specifically to each MK from the right-wing Likud and Jewish Home parties, Gal asserted: "Before we are politicians, we must be humans who support what we have declared to support, without political intrigue. You are being tested." "You prefer to give a price to terrorism than to give a price to Yisrael Beytenu," Gal proclaimed. Justice Minister Ayelet Shaked (Jewish Home), who previously voiced support for the bill, noted the postponement issued by the Ministerial Committee for Legislation, and said, without going into specifics, that the government opposes the bill at this time. The bill failed miserably to pass its preliminary reading with only six MKs voting in favor, while 94 opposed.